This blog is dedicated to exposing blacklisting and blacklisters. We work with unions and activists to fight for workers’ rights – and that means being able to stand up for health and safety without losing your job. It is brought to you by Hazards , the only independent, union-friendly magazine to win major international awards. 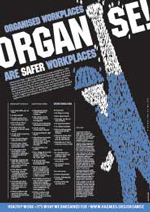 Hazards recognises that workplace unions are your best hope for better, safer work .